You can delete Veeam Agent for Linux backup jobs. When you delete a Veeam Agent for Linux backup job, Veeam Backup & Replication removes all records about the job from its database and console. 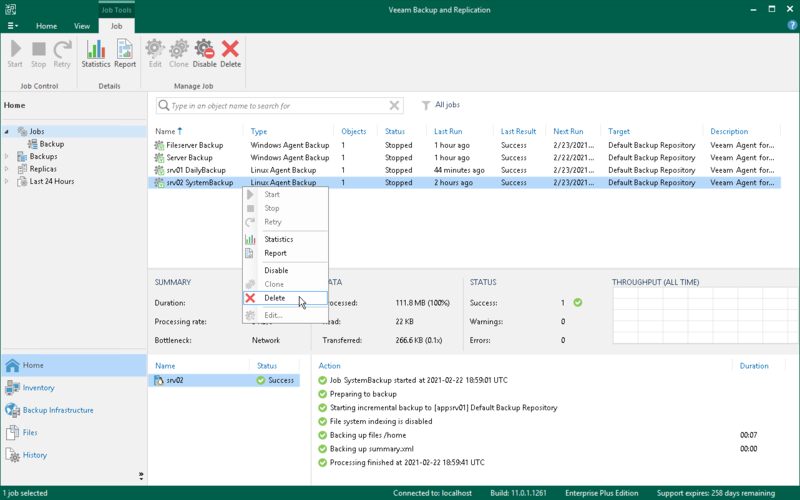 When the user starts a new Veeam Agent for Linux backup job session manually or the job starts automatically by schedule, the job will appear in the Veeam Backup & Replication console again, and records about a new job session will be stored to the Veeam Backup & Replication database. To remove the job permanently, you must delete the job and unassign access rights permissions for this user from the backup repository. Select the necessary job in the working area and click Delete on the toolbar or right-click the necessary job in the working area and select Delete.